Jasper Community Arts' sixteenth annual Chalk Walk Arts Festival will be held on June 1, 2019. 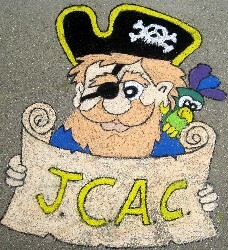 JCA's Chalk Walk is a family-friendly community event intended to inspire and stimulate the creativity and artistic ability in all of us. In the tradition of European 16th Century street painting, Jasper's downtown sidewalks and pavements are transformed into colorful chalk and pastel murals. While this gallery of art will be temporary, the memories are lasting. M-8:30 a.m. - 5:00 p.m.